We recently completed a private jury trial in a major motor vehicle collision, and learned some fascinating lessons about how jurors value less visible injuries such as cognitive impairment. This was a case where a woman in a stationary car was rear-ended by an 18-wheeler at highway speed. 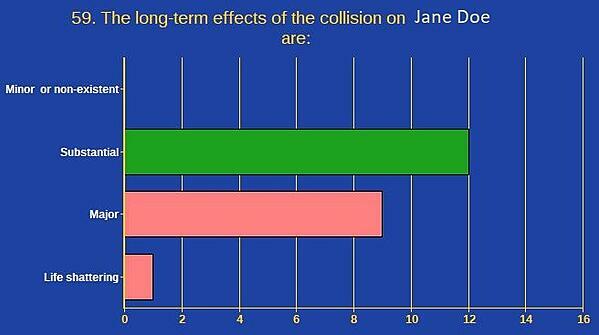 The resulting impact was catastrophic - her car was destroyed, and she sustained major orthopedic injuries. She was also highly intelligent, worked in academia, and claimed severe cognitive impairment as a result of this collision. 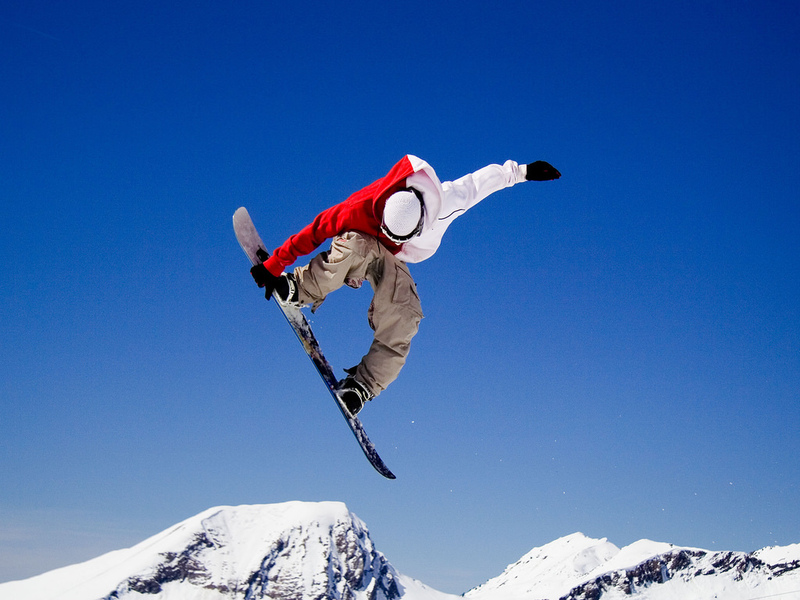 The plaintiff made a full recovery from her orthopedic injuries, and returned to an active lifestyle, including snowboarding - while her cognitive issues continued to cause pain, trouble sleeping, and reduced earning capacity. While sports and other hard physical activities can show a determination to overcome self-pity and move on, the defense attorney in this case was able to use her physical recovery to lower the juror’s perception of cognitive injuries. The trick for both sides is to resist the temptation to ignore this type of evidence. Instead, embrace the issue and win the battle for how jurors will interpret these activities. We know that emotions tend to drive damages in most cases, so those jurors on the extremes for either side are critical. If they believe a defendant’s behavior destroyed someone’s life, big money follows. Win the battle for juror’s emotions, and you win damages. 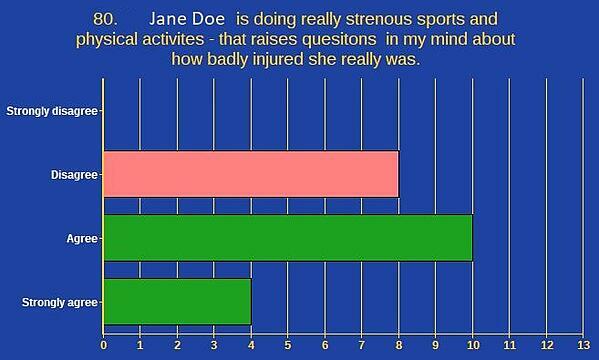 Janet: “she returned to her cognitive baseline, and has returned to strenuous (physical) activities. 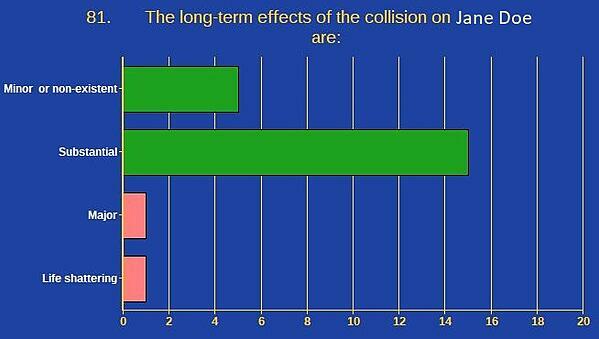 When asked specifically about the level of post-collision physical activity, 64% of our jurors said that it raised questions in their mind about how badly injured she really was. Jurors can emotionally engage with someone’s pain from less visible injuries such as cognitive impairment, PTSD, or CRPS, especially if the plaintiff’s case helps make that pain more tangible (think day-in-the-life videos, medical opinions, before/after comparisons). Conversely, if they are given something more visual to guide their emotions (such as an accident victim happily snowboarding), that’s what they will tend to use to make decisions. How can this help you in your work on cases involving less visible injuries? 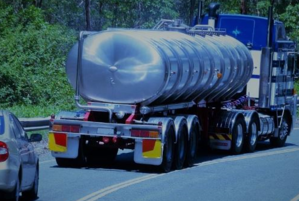 No blind spots - Learn everything you can about an injured person’s post-accident activities. Information is power for both sides, and there should be no surprises. Know what’s on social media! Power in pictures - Plaintiffs need to present visual manifestations of their client’s pain, while Defendants should seek out anything that makes the plaintiff’s post-injury life appear less negatively impacted by the incident. Each situation is unique - Different personalities, areas of the country, and fact patterns all matter. Find out what objective people in your venue think of the specifics in your case… before going into a public trial blind. First Court’s jury research can be very helpful here - Our flexible, repeatable options make it possible to try several different strategies until you find your winning trial home. The bottom line is: visible contrast in an injured person’s life before/ after injury can powerfully impact on damages. Make sure you understand how a plaintiff’s life has changed, convey it visually, and learn how real people in your venue react by doing research in advance. The result? Less risk, better outcomes, and happier clients. Call us at (855) 908-9089 if you are interested in developing targeting insights for your cases. Joe is a mediator, U.S. Coast Guard veteran, husband and father. He lives and works in the Denver metro and is passionate about making our legal system more efficient so people can end disputes and get back to what matters. First Court has helped people evaluate and settle lawsuits throughout the country for 30 years. We are passionate about using our experience, technology, and creativity to make the world a more peaceful place.